You need non-copyrighted music for pretty much any video you’ll put on Youtube. They don’t play around when it comes to protecting artists’ music. The YouTube Content ID system is powerful — it can automatically detect a video using copyrighted music. Whether it’s 3 seconds or 3 minutes, this usually results in your video (and sometimes your account) being blocked. No one likes seeing that face. Luckily, you don’t have to. There are plenty of free resources where you can get awesome music video without any copyrights. That means you can use them for your videos, and even any promotional content for a product or service. Let’s take a look at the best sources of non-copyrighted music that you can use in your videos and productions. When a song’s copyright expires, it becomes part of the public domain. Public Domain4U organizes old non copyrighted songs that are now free and available for download. Since a song copyright lasts for 95 years or as long as the author’s life plus 70 years, the songs on this website are very old. But that doesn’t mean they don’t sound amazing. Some of the more unique genres they have include Hawaiian Music, Ragtime, and Harmonica Blues. Talk about old school! The owner of Public Domain 4 U does an incredible job. The website has been up since 1999 and you can tell that he/she really has a passion for music and just wants it be available for everyone. If classical music is your thing, you’re gonna love Musopen. Similar to PublicDomain 4 U, all of the music on Musopen is in the public domain. They let you browse by composer, and you can even view sheet music. Musopen has a super clean interface. Much more user-friendly than other resources. This is definitely the top source to download non copyrighted classical music. You can even get sheet music from legends of classical music if you want to practice yourself. From Bach, to Beethoven, to Tchaikovsky...Musopen is seriously an awesome resource. 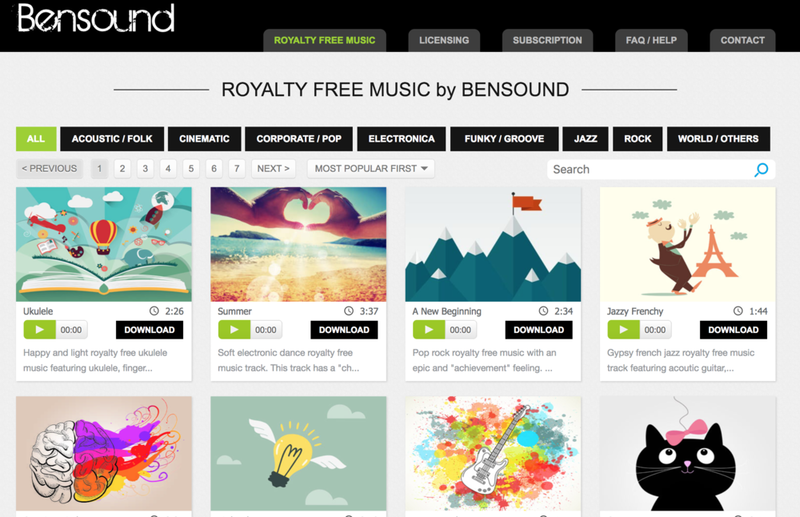 If you’ve got a Youtube video you’re putting together and need some good text for a title screen, chances are BenSounds has the perfect non copyrighted music for you to use. His sounds are really fun and original. The 80+ original sounds are organized into 8 different categories. All of the music on his website are created by Ben himself. Although there are some restrictions (you can’t remix his music or use it for podcasts), all you have to do is give him proper credit and you can use his music for your project. Specbeats is an awesome Youtube channel that offers non copyrighted rap and hip-hop beats for download. If you want to record a freestyle or even a full-length song, you can use his beats without any problem. And it’s not just old school, simple beats. They have trap-style beats, and artists submit their work every day. They even do covers of popular songs with slightly different melodies or instruments so that technically they’re original and non copyrighted songs. Alright, so the Free Music Archive is actually pretty legendary. They have so much amazing music. The Free Music Archive is a library of high-quality audio downloads directed by WFMU, known as the biggest, most influential freeform radio station in America. All music featured on FMU is totally legal and ready for use. More so than being a resource for people’s projects, they’re dedicated to keeping music and music discovery alive and well. The Free Music Archive is truly collaborative. Artists, radio stations, curators, venues, collectives, festivals — so many different groups in the music industry contribute and use the archive. It’s got a community feel, and with so many different contributors there’s a level of discovery not found on any other music resource. Every MP3 music file on the Free Music Archive has been pre-cleared for certain uses. Although some tracks still fall under certain copyright laws, a lot of the music is non copyrighted and perfect for use in your projects. The Audio Library Youtube Channel is incredibly active. And they don’t just put up any random audio clips. All of their non copyrighted music is super high quality, and absolutely perfect for bloggers, or anyone making Youtube videos. A quick browse of their playlists page tells you all you need to know. You can sort tracks and playlists by mood, genre, or artist. 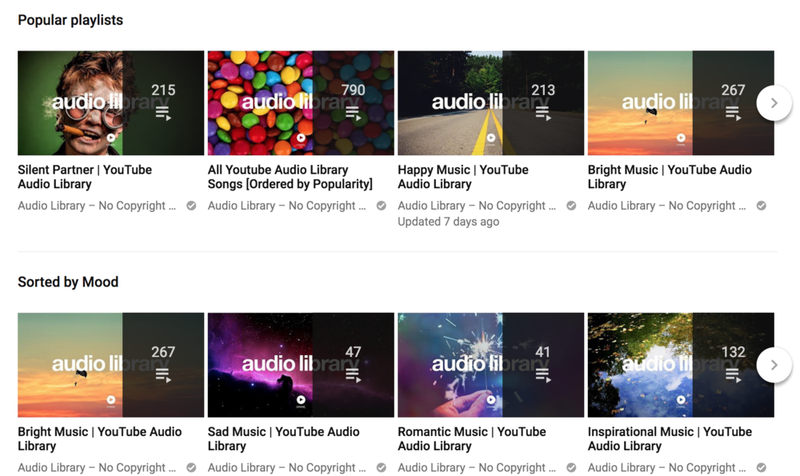 The Audio Library channel has been around since 2014 and has almost 200 million views on their videos. You might think that all their sounds are used, but with almost 1000 different tracks, you can find and download some awesome non copyrighted music for your project. Purple Planet has a much different vibe from a lot of the other free music resources. Rather than focusing on background music for bloggers or Youtube videos, Purple Planet’s focus is music for film projects and bigger productions. So if you’ve got a film project that you need some non copyrighted music for, Purple Planet will definitely help you set whatever mood you’re looking for. 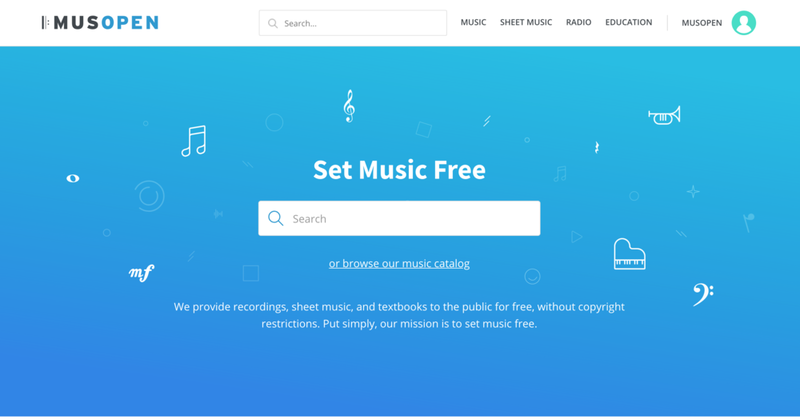 There are tons of resources for free, non copyrighted music out there. Regardless of if you’re a blogger, or you need some music for a bigger project, you’ve got a lot of options. Don’t risk promoting your Youtube videos or blog projects with copyrighted music. They will almost certainly get flagged, and it can be hard to move forward. If you have any other sources for non copyrighted music, please share!